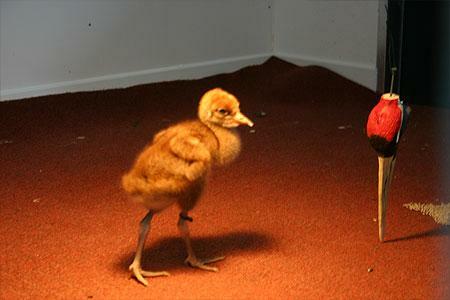 Summer 2010: Chris (Christine) hatched with very dark and fluffy plumage and is a very pretty bird. She has no siblings. She liked to explore a lot, so ended up being a bit of a loner for a while and also didn't like going to bed. She has bonded with the group better but is quite low-ranking and makes up for it by taking it out on her human foster-parents, whom she likes to boss about. She has developed a degree of clinginess too and can be hard to leave / get away from when in costume. 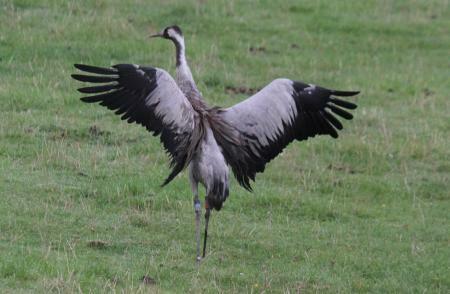 September 2010: Chris started becoming quite aggressive and showed some extreme crouching responses (refer to PDF guide to crane behaviour on crane life pages) to our presence in costume, but observing her when we were not present in costume she has impeccable behaviour! Observing her wild crane behaviour whilst unseen from a secret hide helped to inform the decision to reduce the number of times we appeared in costume with the birds. She can often be found with Squidgy and Ruby and often with Minnie’s (rather than Clarence's) cohort. Chris has a slightly dangling right leg in flight - but seems to walk well, and the leg does not seem to cause any problems for her. October 2010: As our contact with the birds as crane 'mum' and 'dad' has reduced substantially, so Chris's behaviour has improved! She is now spending a lot of time with Clarence's group as Minnie's cohort has broken up a bit. It is great to see her spending most of her time foraging with the other groups of birds, as before she was alone quite a lot. 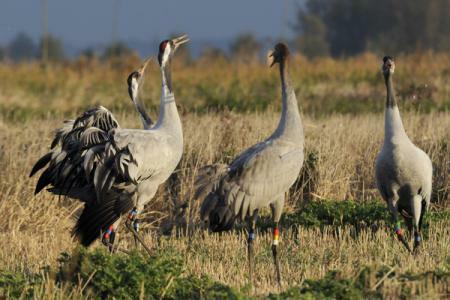 November 2010: In recent weeks the cranes have all joined forces with Clarence’s group and are now usually moving as a group of 20. As the nights draw in and it gets darker and harder to see the birds, Chris is still easy to spot as she is still flying with one leg slightly dropped. The group have found many new fields to explore and are often found foraging on maize stubbles, a new favourite food for Chris! January 2011: It is great to see that Chris has just become one of the flock during the coldest December on record and has been keeping her head down and getting on with it! Her leg still dangles in flight, making her the only bird that is clearly indentifiable as an individual when airborne but it does not seem to impair her ability to walk or fly in any way. March 2011: Chris is still doing well and behaving nicely as one of the flock. Her leg still dangles when she is flying, so we can always recognise her. As with Gemma and Bart, she has also become more of the more vigorous dancers in the group. April 2011: In late April, Chris took a flight out to Shapwick NNR and Catcott Lows SWT reserve where she roosted the night along with Clarence, Gemma and Bart. The next day, however, she returned and has been getting along well with the rest of the group. September 2011: The older birds have all been making regular visits to the Somerset release enclosure, with much interaction taking place between the 2010 and 2011 cohorts. When approached by the crane parents in costume, Chris showed the most threatening behaviour, and she was definitely willing to assert her dominance! June 2012: In early June, Chris headed up to Slimbridge in the company of Monty, Ruby and Sedge and spent most of the summer on and around the Slimbridge Reserve. She also made a bit of a nuisance of herself around the chick rearing enclosure and was seen pacing the fence a number of times. She was approached and captured by Harry and Amy in costume - really as a way of trying to scare her off from the rearing pens, so that the younger birds were not intimidated by her, or to prevent her injuring herself on the fence. The capture also provided an opportunity to re-fit working GPS data logger harness and radio tag to the bird which was done. August 2012: Chris managed to get tangled up in a fence line at the Slimbridge rearing centre, and was rescued by Amy and Harry. She seemed in a bit of a bad way - and blood tests taken later showed that she had some kind of infection that was probably making her unsteady and feel unwell. September 2012: Chris appears to have made a full recovery. December 2012: Having spent all summer at Slimbridge, Chris returned to the Levels and Moors along with Ruby, Sedge, and Monty on Dec 13th. January 2013: Chris headed back up to Slimbridge on Jan 28th along with Ruby, Sedge and Monty. April 2013: Monty was observed mating with Chris, and nestbuilding from one of the Slimbridge hides along with Ruby and Sedge - who were later chased away. Chris appears to be 'in a relationship with' Monty. Later in the month, the nest site moved, and the pair were seen incubating from late April. If the egg or eggs are fertile they should hatch around the end of May. June 2013: Chris' one egg is believed to have hatched on 26th May, but the chick was sadly lost sometime over the next couple of days - the cause of death is unknown. 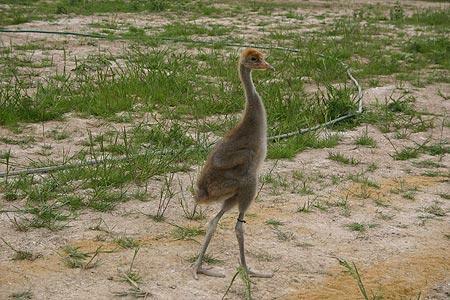 This was the first chick produced by any of the project birds. Well done Chris and Monty! July 2013: Chris headed back to the Levels and Moors with Monty in early July. She did not go on to moult , like her partner Monty, so presumably will moult in 2014. January 2014: Chris remained faithfully with Monty whilst he underwent his moult in Somerset, and the pair then soon headed back to WWT Slimbridge, where they quickly began pair bonding behaviour and were seen displaying and mating in January. It seems likely that this pair will make another breeding attempt this year at Slimbridge. July 2014: Monty’s partnership with Chris seemed even stronger this year, and the pair soon established a territory at Slimbridge, with incubation observed from April 17th. The pair carried out a successful incubation with 2 chicks seen on 18th May. Sadly both chicks didn’t make it to fledging – one being lost at 5 days old, and the second at 18 days. No specific predation event was observed, but there is loss is most likely due to a predator such as a fox. Chris went into moult at Slimbridge in June – but subsequently disappeared. 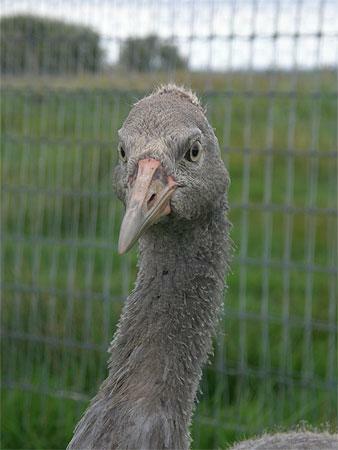 She was not seen from June 20th until August 15th when she was seen again - still flightless and in poor condition. 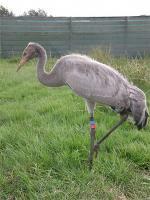 She was caught by the WWT team, treated for worms, a blood sample taken to test for disease and released. By 20th August she was flying again and seems to be recovering well. July 2015: Chris went on to make a full recovery and spent the winter of 2014/15 with the Slimbridge-based flock. However, in the Spring of 2015, despite remaining with Monty at Slimbridge and undertaking some tentative nest-building the pair did not go on to make a breeding attempt. February 2016: Chris was again captured in the late summer in an emaciated state, with some damaged primary feathers. She was treated and put into a fox-proof area for a while, before going on to make an apparent recovery. However - things took a turn for the worst and Chris was recovered at Slimbridge very unwell, and in a poor state - and for her own welfare she was put down on 16th Feb 2016. She was a real character - and will be remembered fondly by the Project team.